Use these fun books and activities to teach kids about Saint Valentine’s Day! Valentine’s day is full of sharing our love for one another, lots of hearts and flowers, and delicious treats…but why? Why do we celebrate Valentine’s Day on February 14th and why is that a day to share our love for each other and gift them with hearts, cards, and flowers? February 14th is actually the feast day of Saint Valentine! As much as we love all of our fun Valentine’s Day activities we love to teach the history of these special Holidays, especially when we get an opportunity to teach about a Holy Hero (aka a Saint!). Unfortunately, as with many of the early church martyrs, we don’t have much history to go off of. But we do know a few things about Saint Valentine. We know that St. Valentine was arrested, condemned, and ultimately martyred for the faith. His love for the Church and the Lord is what we remember and share on Valentine’s Day. There are so many legends and customs associated with how Valentine’s Day came about it’s hard to even keep them straight – but regardless of weather or not you celebrate with candy and flowers you can also teach the love of God to your children by learning about Saint Valentine. The children will also love this Brother Francis coloring book of Saint Valentine. My Valentine for Jesus is a board book to teach the little ones about the meaning of love. Make a match-box treat holder with a picture of Saint Valentine. Share them with your friends and classmates. 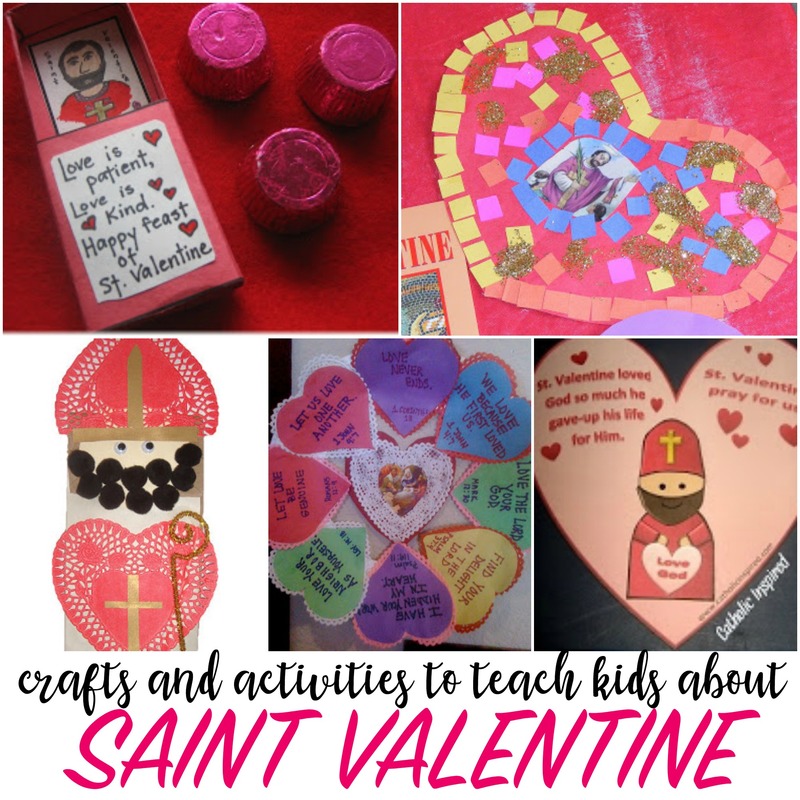 Make a heart shaped Saint Valentine Craft to go along with your Story of Saint Valentine – this is easy to make using a Saint Valentine Prayer card. Make a Saint Valentine Scripture wreath and share all that you know about love. Print and Play with this Saint Valentine word search. Make a cut and paste Saint Valentine Heart. Make a Saint Valentine Puppet and read one of your Saint Valentine Books. Countdown to Valentine’s Day with a Saint Valentine Scripture chain. Nice advertisement and wonderful tips thank you for sharing with us.